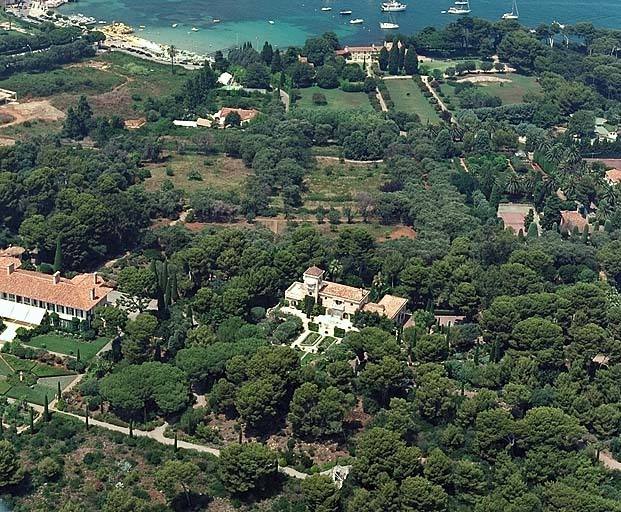 Sir Charles Mac Laren, who was seated o the chamber of lords under the title of Lord Aberconway, bought in 1907 a piece of land of 4 acres at the point of the Cap d’Antibes. He chose the English architect Ernist George to build a property with a long facade with half moon windows. A Scottish baron and the lawyer of Edward the VII, Lord Aberconway build a magnificent park with a long stairway leading to the sea. French gardens, a pergola, rosebushes of 12 meters, iris and begonias, all making the property proud. All of these factors allowed the garden to compete in the competition of the most beautiful gardens of the Cote d’Azur and received the visit of the Duke of Connaught in 1919. Through the three arches of marble in the entrance hall, the interior of this demure holds a vast entrance hall furnished in a rustic style which contains a wonderful copy of a Florentine buffet from the Renaissance. The Chateau de la Garoupe was left in the hands of the daughter of Lord Aberconway, whos husband the Right Honorable Sir Henry Norman increased the size of the property and built an extra level. A journalist and a great traveler, he carried out several world tours and publishes his reflexions. Worried about the preservation of nature, Henry Norman militated for a long period in the columns of the Pall Mall Gazette for the preservation of the Niagara falls. Today, the domain has been well kept, with many of its original features.